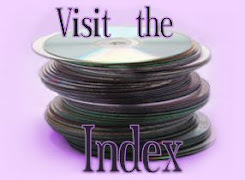 DVD Exotica: Rabid Grannies - Has the World Gone Crazy? 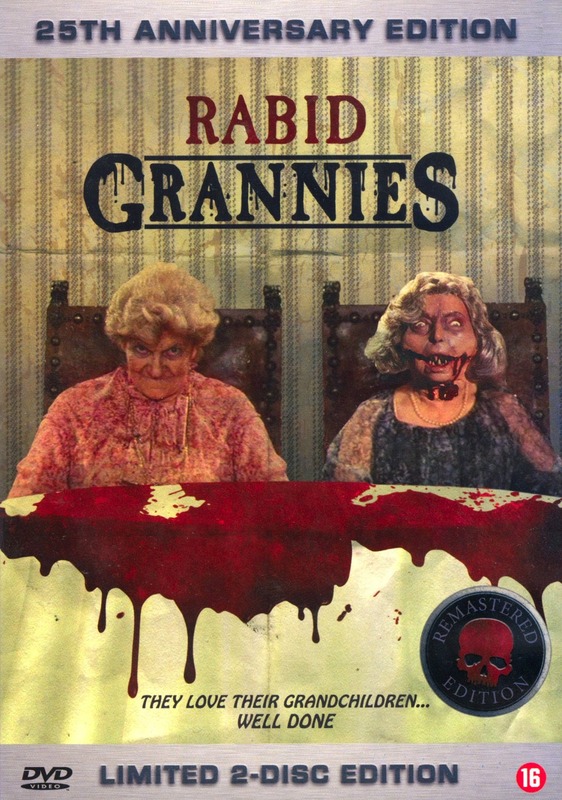 Rabid Grannies is a fun little horror comedy. It lives up to its title, which is a lot more than you'd expect. A snobbish, aristocratic family gathers together for a holiday celebration (yes, this is a Christmas movie!). Turns out they've made a little enemy, though, who just so happens to be a witch. She sends the family a gift which, when opened, turns the films two matriarchs into demons. So the rest of the family must run and fight for their lives as the grannies dispatch of them in supernatural and very gruesome ways. This film's got some really nice production values, a great location, quality special effects and a big cast. The acting gets a bad rap, because this film is dubbed... and it doesn't help that everybody is playing it broad for the satire. But it's actually a pretty strong cast and a genuinely amusing script with more great kills than you can shake a stick at. Unfortunately, it's had a tough road on DVD. Troma released it in the US, but heavily edited and with an ugly. full-frame. It was released by Eurpoean/ Japan Shock on identical Holland and Japan discs, widescreen and uncut, but with conspicuous, unremovable subtitles burnt into the image, and still a murky, unimpressive picture. So in 2012, I was really excited to hear that the film's original producer Johan Vandewoestijne (a.k.a. James Desert) was releasing it via his company Zeno Pictures, as a 25th Anniversary Special Edition. A loaded, 2-disc cut with a new edit of the film. Wait, what? Here's what they said, "In the original version, the horror starts after 36 minutes. 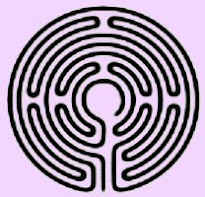 Now we made a re-edit and everything that what we called ballast is thrown out. So now the horror starts after 12 minutes. All the original gory scenes remained. We made new credits EVERY SINGLE shot was resized to a scope version. But we made sure that during the resizing 'no heads' were cut off." Uhh, not so sure about this "re-edit" notion... But fortunately the set also includes the original cut on the other disc, so everybody wins, right? Let's start with disc 1. The discs are only labeled "Disc 1" and "Disc 2," so you have to put them in your player to find out which version of the film you're going to watch. But, that's a piffling, nitpicky criticism, no time to get bogged down in little issues like that. We've got to get to Disc 1, let's see which version it is. Why, it's the old European Shock disc. I sure didn't see that one comin'. Literally, it's the same disc, with the same menus, features and even Shock's company logo at the start. One of many shots only in the uncut version. Now, previous to this edition, as I said, the Shock DVDs were at least the best way to go for this film. 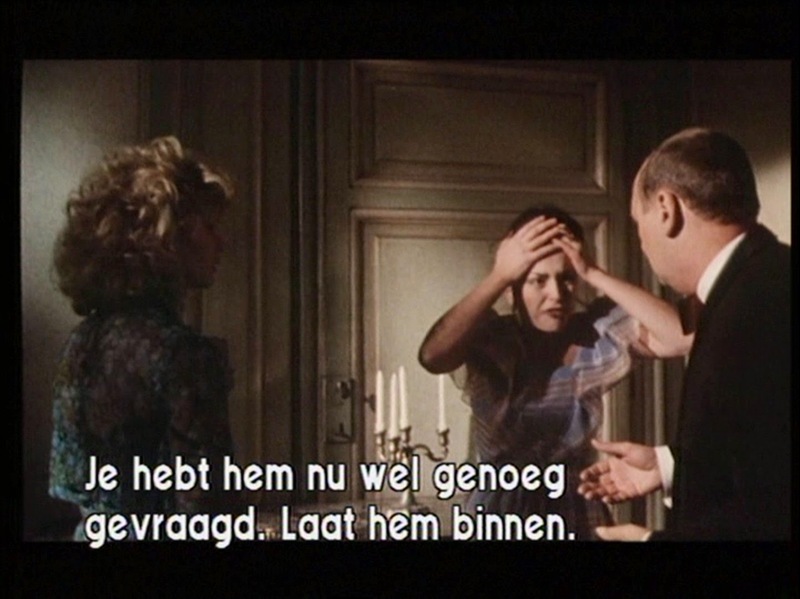 Soft and non-anamorphic with huge Dutch subtitles burned into the picture. But at least it's widescreen and uncut, and a lot better looking than the muddy Troma VHS-sourced presentation. And so Disc 1 is literally, exactly what we've had before. And it even has a couple little extras, taken from the Troma disc. 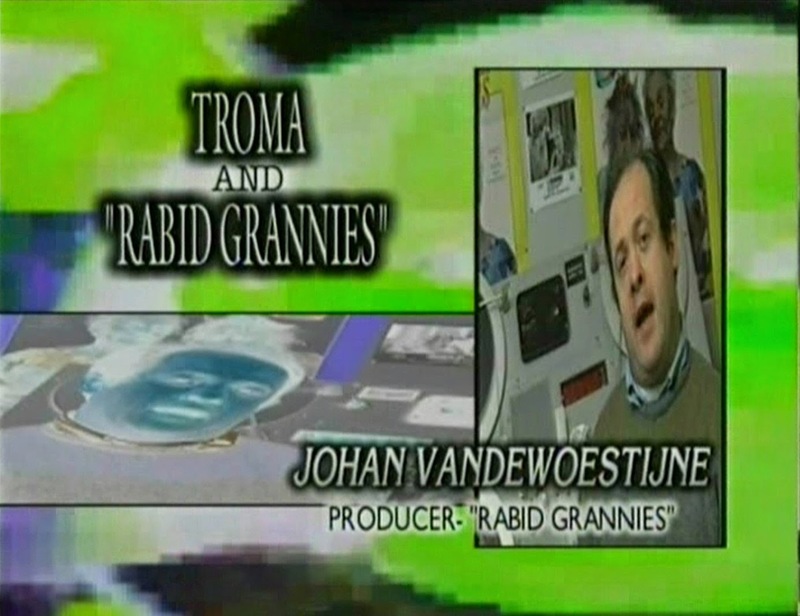 There's a very brief, three minute interview with producer Vandewoestijne full of Troma graphics and weirdo edits... but at least he's talking about the movie. And there's also an interview with the "Original R. Grannies." That sounds promising until you find out it's actually not an interview with the original rabid grannies stars at all. It's a silly 2 minute interview skit with a random woman Troma hired to pretend to be a rabid granny. There's also Troma's VHS trailer and a junky photo gallery. You might recall that Troma's disc had an audio commentary as well, by writer/ director Emmanuel Kervyn. Well, that was never on the Shock discs and it's not here either. Part or all of the issue there is surely that the commentary was recorded for the heavily censored shorter cut (not to be confused with the new, even shorter cut made for this 25th Anniversary), so it wouldn't sync up here. Troma included the gore footage only as deleted scenes outside of the main film. But for this big, special 2-disc set; it would've been nice if they squeezed the commentary in somewhere. To be fair, cut off heads like this are not the norm. Oh yeah, now we're cookin'. It's, uh... wow. Where to start? Well, to start with, they certainly didn't go back to original film elements. No, this transfer was made using... the Shock disc transfer from Disc 1. They up-scaled it, so it's anamorphic now. But there's no additional detail or anything, because it's just Disc 1 ripped and encoded an additional time to make it 16x9. 'So, they literally didn't do anything to it? It's just disc 1 made anamorphic?' Oh, no, no. They certainly did... things to it. They cut about twenty-two minutes out of it, for a start. Yeah, the back of the box and the advertising all call this new cut 75 minutes, but it actually only runs for 66. Tighter pacing? I guess, but you'd have to really dislike the original to think it's a better film in this cut. Literally an entire third has been removed, often in big chunks. Sure, there's films I dislike and think the only way to make it better would be to make it shorter and shorter; but I generally don't buy those movies on DVD. Who is this set being marketed to? "If you hate Rabid Grannies, you'll hate this less. Only $25!" They also tweaked the colors, often heavily tinting a scene to be a certain color. And they upped the contrast and generally tinkered around with it in an editing program like Final Cut. You could argue that aspect of things looks better. Maybe, in some shots (we'll come back to this). The boosted contrast at least makes the blacks blacker, and to be fair, they didn't do a bad job with the new colors. Some shots look downright nice. It's not faithful or respectful of the original film; but it's not terrible work in that department. But the framing! Oh, let's talk about the framing! Yes, it's in "scope" now, roughly 2:35.1. Of course the film wasn't shot to be screened in that ratio, so why is it now? I guess the producer (Kervyn was not involved with this release) just thought it looked better in scope, right? Actually, no. The real reason is obvious once you look at these discs. This print was taken from the Shock disc, right? And the shock disc had huge, burnt in subtitles, right? Apparently, Vandewoestijne had no access to any film materials the rest of us in the general public have - the existing DVD. So to get rid of those big subtitles, he cut the bottom of the picture off! Shock version on the left; new "scope" version on the right. They cut off practically a third of the picture, mostly from the bottom and some from the top, just to hide the subtitles they couldn't get rid of. I mean, I guess you have to give the guy a little credit just for having the gal. It's in "Scope!" You'll have to travel far and wide to find a movie mistreated worse than this one is here. ...And does the new colorization really look better? Sure, the Shock disc is faded; but where did their eyes go? You can't see their faces in this new "improved" version. And the new credits they speak of are pretty immaterial... the original and new ones are both just simple white text against a plain black background. The new credits are just made to replace the lower quality of the original transfer (video shakiness and blurriness), and most of the credits have simply been removed entirely from the new version. To add frustration to the fire, Disc 2 features a new, 37 minute "Behind the Movie" documentary. But there is no English audio or subtitling. Ahh! It looks really interesting (even though they stretch their behind the scenes VHS footage from 4:3 to 16x9); but I guess I'll never know. Oh well. As a fan of Rabid Grannies, I would actually have loved to watch that. Amazingly, this film has gotten good reviews and praise from various sources. Frankly, I'm shocked (pun intended - I'm here all week!). 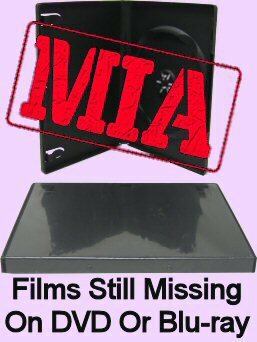 If you're looking to own this film on DVD, though; I guess it's literally no worse than the previous Shock disc. Since it actually contains the original Shock disc. If you can speak Dutch, then that new extra will be a real nice bonus; otherwise they're interchangeable, as the 2nd disc adds no value. You may also want to pick up the Troma disc, too; for the commentary. But this film minus the violence is really spoiled experience, so I'd only recommend that disc if you've already got one of the others. Plus, this set seems to prove that Vandewoestijne does not have the original masters, so there's not much hope in holding out for anything better. Shock version on the left; Troma disc on the right. As you can see, and as we already knew, the Shock disc is widescreen and the Troma disc is fullscreen. Troma's disc is not open matte; it's clearly chopped off on both sides. I've matched the two images up vertically to show how they're also framed slightly differently, with a little more information on the bottom on the Shock disc, and more on the top with Troma. Image quality wise they're different, with the Shock version clearer, warmer and more distinct; but it's not a huge gap - both would benefit greatly from a restoration, and both handily trump the scope version. It's nice that the subtitles aren't burnt into the Troma disc... that might almost make it preferable to the Shock disc (that will ultimately boil down to personal opinion of the viewer). But of course the real Achilles' heel of the Troma disc is that it's cut, which really slices the fun out of this movie. As I mentioned above, The Troma disc does include the Desert interview, fake rabid granny skit and, trailer and photo gallery that were ported over to the Shock disc, and it has that commentary. The commentary is actually pretty good... He comes off a little self conscious and schticky at first, and he does sometimes explain what is obviously transpiring on-screen. But once he picks up his momentum, he does wind up getting pretty informative and entertaining. There's also a very brief introduction by Lloyd Kaufman, where he talks about how the filmmakers originally contacted Troma and got them to distribute the film. Deleted scenes of the missing gore footage is included (twice! Both as individual clips and as one long montage), but without the audio... and obviously seeing them outside of the film isn't an effective substitute for seeing the movie uncut. 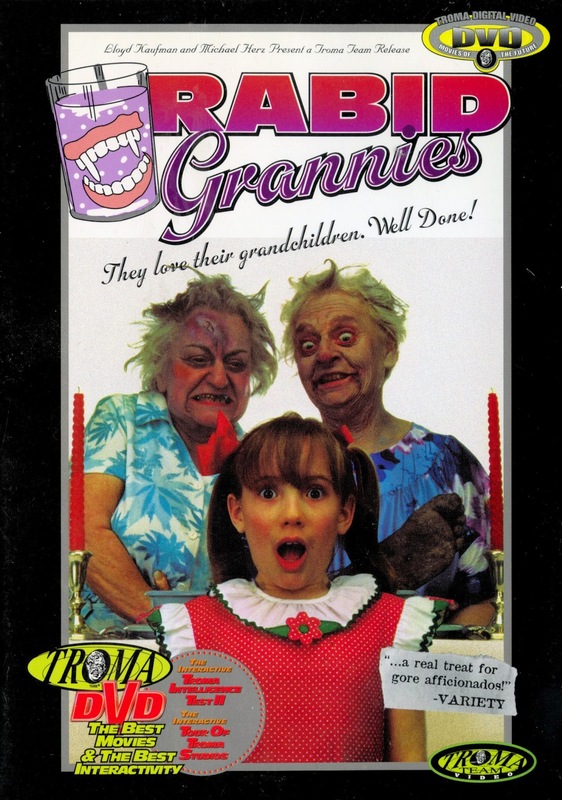 Anyway, there's also a big load of Troma shovelware features that have nothing to do with Rabid Grannies. Curiously, even the interview with Dario Argento from their Stendhal Syndrome disc is on here. So, like I'd concluded before; this disc is only of value in conjunction with a proper, uncut and widescreen Shock disc. But if you're a bigger fan of this film, it can typically be found very cheap and makes a nice companion piece just for the extras. The original pressing of the Shock disc had a second disc with the hilarious FORKLIFT DRIVER KLAUS short on it -- I definitely won't be dropping that release any time soon! It's a shame this title can't seem to get a fair shake -- I wonder if the materials were sent to Troma when they purchased North American rights? KLAUS is sheer genius. I have the standalone disk. A sequel came out within the past year, but I have not seen it yet. For GRANNIES, I went with the XT Video 2-disc edition which has 3 versions...still 2 more than I'll ever watch. I think I'll wait for the reviews first. Yeah, crazy. I saw it like an hour after I updated this post. I *HOPE* we get a nice, HD version of the widescreen uncut version, but I'm pretty skeptical.